From May 10 to 20, 2017, India Council for Integral Education (ICIE), a unit of Sri Aurobindo Society, conducted its annual workshop on Integral Education ‘Basic Course in Integral Education—Theory and Approaches’ in Puducherry, for teachers, principals, educationists and parents. The 45 participants from 12 states underwent a transformational journey through the principles and practice of Integral Education, as envisioned by Sri Aurobindo and the Mother. The teachers as a part of their ‘Learning from Nature’ module visited Matrikunj—the organic farm of the Sri Aurobindo Society. Integral education includes learning, appreciating and understanding the beauty of Nature. It also includes communing and exploring the natural surroundings that instills in all of us a sense of belonging and curiosity about life, while building meaningful relationships with the natural world. A number of games were also arranged to inculcate the importance of values such as concentration, creativity, harmony, teamwork, enthusiasm, etc., which the teachers need to pass to their students, irrespective of which subject they teach. 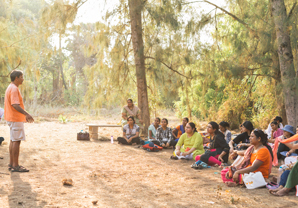 In addition, the participants were taken for a nature walk around the herbal garden of Matrikunj, where they experienced the flavours and fragrances of the different herbs being grown. 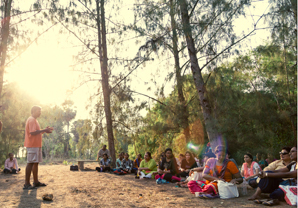 Baburam, the resident agriculturist and facilitator of the walk, spoke to the participants about the medicinal values of each of the herbs and elucidated upon herbal preparations that can be incorporated in one’s diet to increase health quotient. Finally, the participants got to taste herbal tea prepared with ingredients obtained from the farm and also caught a first-hand experience of the herbal tea being packaged at the time of their visit.